Ebola panic and overreaction: Hazmat suits and negative air pressure are unnecessary. The health care system’s mixed messages about Ebola. A Los Angeles Fire Department paramedic truck drives past a plane from New York’s JFK airport on Oct. 12, 2014. The plane was diverted to a remote gate after a passenger on the flight exhibited flu-like symptoms. A week ago a man with an apparent flu-like illness and a recent travel history to Liberia entered my emergency department. Before anyone realized he was an actor in a New York City Department of Health-mandated Ebola-readiness drill, he was isolated in a negative-pressure airborne pathogen isolation room. His providers donned the appropriate personal protective equipment upon entry to his room, and doffed it correctly when they exited. My colleagues passed this test. The day before, two passengers on a flight arriving to Newark Liberty International Airport from Brussels were pulled from the plane on the tarmac and dramatically evacuated to a local hospital by hazmat-suited Centers for Disease Control and Prevention officials to be evaluated for suspected Ebola infections. These two seemingly encouraging examples of vigilant medical responses may actually be harbingers of an emerging problem: the overutilization of medical resources in response to widespread panic, and not to genuine medical needs. Nationwide concern has metamorphosed into near bedlam after news that a nurse in Texas who cared for the first Ebola patient diagnosed on American soil has herself contracted the virus. In the past 24 hours, authorities briefly closed an entire hospital in Braintree, Massachusetts, after an “extremely low risk” patient set off Ebola concerns. 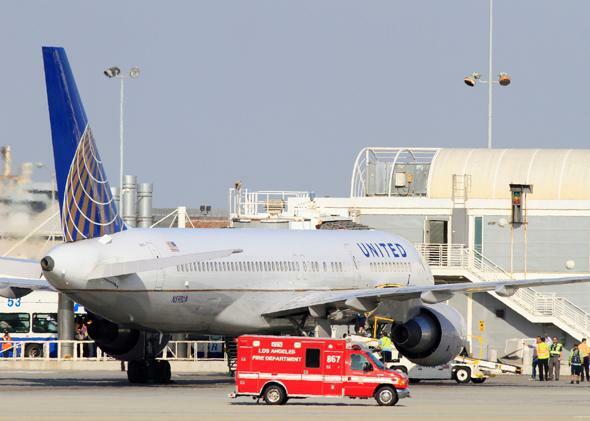 In Los Angeles, a flight from New York with an airsick passenger who had recently visited South Africa was diverted to a special terminal and met by a cavalry of local medical authorities. To put this in context, most points in South Africa and Liberia are farther apart than the distance between Chicago and the North Pole. Ebola can be spread only by directly touching an infected person’s skin, blood, or body fluids and then immediately transmitting that contact to the mucous membranes, such as the eyes or mouth, of an uninfected person. Ebola is not airborne, and we should not treat it as such. As the CDC has stated, medical providers need sturdy blue gowns, gloves, and a mask with a face shield to take care of suspected Ebola patients. They do not need to wear hazmat suits. Suspected patients should be kept 3 meters away from other patients and given masks of their own. They do not require negative-pressure airborne isolation. Private rooms are nice, but not necessary. However, the CDC’s behavior has consistently exceeded its own reasonable guidelines. It was not necessary or helpful to transport American health care workers with Ebola from Africa to Atlanta’s Emory University Hospital via special airplanes accompanied by doctors in spacesuits. But intimidating paraphernalia and fanfare were very effective at creating mass panic. Now others are following the CDC’s lead. So what’s the problem with a little overvigilance? The answer lies in systemic capacity. Every day, well more than 50,000 transatlantic passengers arrive at the New York metropolitan area’s airports. If any of these passengers become sick, they appear to be fair game for the spectacle we saw in Newark and Los Angeles. Moreover, we are entering flu season. The previous three months have been the lowest of the year for emergency department visits for flu-like illnesses, as is usual during the summer months. Last year the number of ER visits for flu-like illnesses in New York City swelled sixfold during the height of the flu season, from a low of fewer than 80 visits per day to a zenith of nearly 500 visits per day. If the Ebola detection system continues to widen its net during flu season and to provide airborne isolation precautions for suspected Ebola patients following the spectacular example the CDC has set in public, we will quickly fill the approximately 200 negative-pressure airborne isolation rooms in New York City emergency departments. This will make it harder to isolate patients who truly require these facilities—including the hundreds of laboratory-confirmed cases of airborne diseases tuberculosis, varicella, and measles we treat annually. The new case in Texas underscores this point: We need to focus on properly adhering to prevention techniques that we know decrease the spread of this disease. We should not add burdensome extras that look good for the media, do nothing for safety, and scare other patients away who need immediate medical evaluation. Behind closed doors some local officials have expressed frustration with the CDC’s example and its mixed messages. Currently, many of your top doctors and health care policy leaders are doing a poor job of distinguishing between systemic readiness and panic. I invite laypeople to encourage their health care providers and government agency leaders to remember this crucial distinction, both for this current epidemic as well as the inevitable next one. The opinions presented are solely those of the author and do not necessarily represent those of the Mount Sinai Hospital, the Mount Sinai Health System, or the Mount Sinai Department of Emergency Medicine.